- Total length: About 14"(35cm), elastic. - Prevent your glasses from falling when you are doing sports. - Elastic spandex strap design, make it suitable for both adult and children to wear. - Designed for thin frame: frames wider than 1cm may not fit easily. - Also act as a great decoration for yourself or your friends. Simple and practical design, and easy to use. - Does not soak up sweat, get dirty, stink or fray and keeps your eyewear secure; Ideal for fishing, biking, hiking, rock climbing, snow skiing or just enjoying the great outdoors. - keeps your glasses secure around your neck, allowing sunglasses to be comfortably hung on your chest, or rest on top of your head. - Adjustable toggle on cords ensures that straps will not easily fall off and are comfortable for all head sizes and shapes. Definitely Super Valuble:HoLeis sunglass holder strap has comfortable spandex braided cord, long lasting and fashion. Adjustable toggle on cords ensures that straps will not easily fall off and are comfortable for all head sizes and shapes. 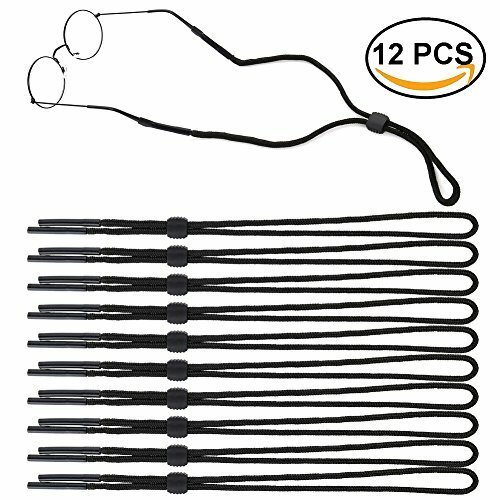 Best Size:HoLeis universal fit rope eyewear retainer neck strap rope lanyard holder is approximately 11.8"(30cm) long, keeps your glasses secure around your neck , allowing sunglasses to be comfortably hung on your chest, or rest on top of your head. Multi-Function:Does not soak up sweat, get dirty, stink or fray and keeps your eyewear secure; Ideal for fishing, biking, hiking, rock climbing, snow skiing or just enjoying the great outdoors. Package Content:Convenient 12 pack (No need to switch between frames). Fits many different kinds and brands of eyewear. Adjustable toggle on cords ensures that straps will not easily fall off and are comfortable for all head sizes and shapes. Customer satisfaction is our first priority. We guarantee you will love our eyeglass straps, that's why our product is backed with a 100% money back guarantee. If you are unsatisfied in any way with this product, we will refund your money, no questions asked. If you have any questions about this product by HoLeis, contact us by completing and submitting the form below. If you are looking for a specif part number, please include it with your message.